Here's a little something I've been thinking about for a while for my Operation Write Home cards. I wanted to make something a soldier could send home that had a little something extra. I figured, sometimes they might want to send a little gift, but it's not like they can just run to the mall. Know what I mean? Anyway, I came up with this idea. I thought the tag would make a cute bookmark. The sender could even add a little note on it to make it more personal. Whatcha' think? I cut out the pocket with PaperTreys seed packet die, then stamped the inside with Text Style and the Apple image from Fruit Fusion: Apple. 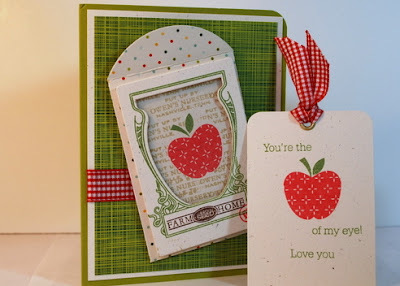 I cut out the bookmark, rounded the corners, then stamped the sentiment and apple image (Fruit Fusion again), tied on a ribbon, and there you have it. Thanks for stopping by today. Have an inspired day.